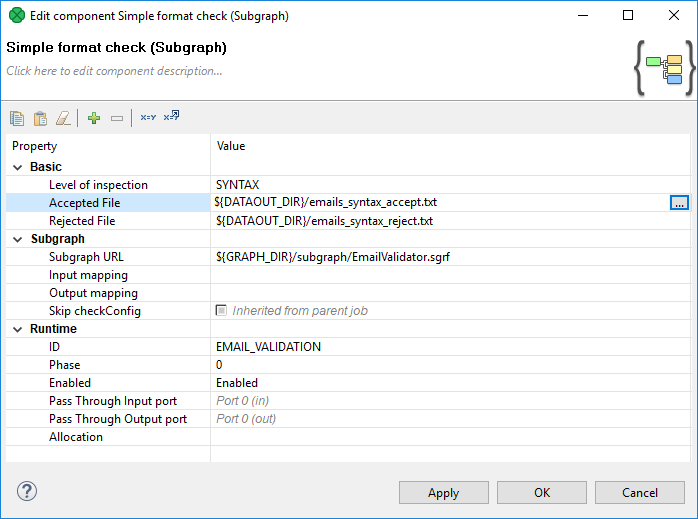 Drag and drop a subgraph *.sgrf file from the Navigator view into the Graph editor. This will automatically create a Subgraph component and configure it to use the selected subgraph. Insert subgraph using the Add Component dialog (activated via Shift+Space shortcut). Subgraphs can be selected as ordinary components, you can search for available subgraphs by entering the keyword “subgraph” into the search filter. The dialog displays subgraphs from a project where your graph resides. Drag and drop the Subgraph component from the Palette → Job Control section to the graph editor and configure the Subgraph URL attribute to point to subgraph definition. Subgraph is configured in the same way as any other component -	using attributes. Graph parameters and dictionary passed into the graph can be changed or set up in the Input mapping	attribute of the Subgraph Component. The subgraph on figure above has two user-defined attributes: Sort key and Filter Expression. The Subgraph component does not have a fixed number of attributes. The subgraph can expose any attribute of a component being used in the subgraph using public parameters, the values are set up as attributes of the Subgraph component. This way you can, for example, set up filter expression used in a subgraph using the attribute of the Subgraph component. Meaning and type of user-defined attributes depend on particular subgraph.